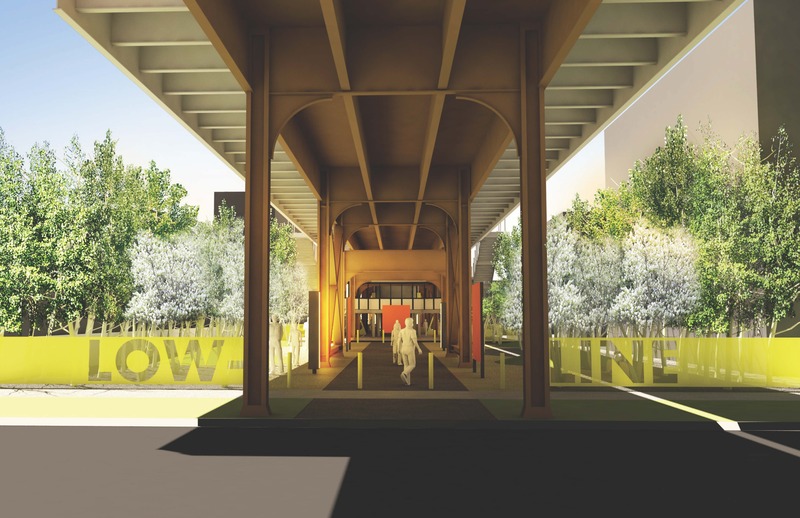 The Lakeview Low-Line re-envisions the half-mile space beneath the CTA elevated tracks between the Southport and Paulina stations as an exciting Chicago art destination and a fun and dynamic path connecting Lakeview, and we need your help to make it happen! To activate this underutilized space, mural walls along the walkway will play host to rotating art exhibits, creating a larger-than-life outdoor gallery. An interactive light installation along the length of the path will playfully celebrate the ‘L’ structure, creating a quintessentially Chicago experience. And new greenspace and plazas will beautify the neighborhood and provide opportunities for programming. This is our vision for the future Lakeview Low-Line. We have completed Phase 1, which included plazas at Southport and Paulina, providing new public art and seating, as well as expanded space for the Low-Line Farmers Market. Now we are ready to embark on Phase 2: a pathway connecting Paulina to Ashland, including more art, creative lighting, and a new park on the west side of Marshfield that will immerse Low-Line visitors in an urban forest! As a unique linear attraction, the Lakeview Low-Line will not only beautify and green the neighborhood, but also has the potential to become a landmark attracting attention to Lakeview and Chicago while encouraging both visitors and residents to explore Lakeview’s local business districts on Southport and Lincoln Avenues. Will you donate today to help us meet our goal? Reach $50,000 by Dec. 2018 in order to fund construction drawings and to place an order for the creative lighting installation with a long lead time. GOAL MET! Reach $125,000 by Spring 2019 in order to start construction of the art walk connecting Paulina to Ashland. Reach $250,000 by Spring 2019 in order to start construction of the urban forest park at Marshfield. Reach $300,000 by end of 2019 in order to complete funding and cover ongoing maintenance expenses. For more information, visit www.LakeviewChamber.com/LakeviewLowLine. Additional sponsorship and giving opportunities are available above the $1,000-level -- click here for details on more giving levels. Contact Lee Crandell, Lee@LakeviewChamber.com, 773-472-7171 x102 with questions or to pledge as a sponsor. The Low-Line project was first introduced in the 2011 Lakeview Area Master Plan as a means of connecting the neighborhood’s unique sub-districts and beautifying the area for local residents while attracting visitors. In 2013, the Lakeview Chamber and Special Service Area 27 started the Low-Line Farmers Market to test the concept of programming space under the elevated tracks, and the market has been a great success since. In 2017, Special Service Area 27 completed development of a new plaza at the Southport station, installing new mural walls and creating an improved space for the farmers market and other programming. In 2018, Special Service Area 27 completed Phase 1, including new spaces at the Paulina station and at Ashland, and Friends of Lakeview unveiled plans for Phase 2 to connect Paulina to Ashland. There is not yet a timeline or design for Phase 3 of the Low-Line, which would link Ashland to Southport, completing the project. The Lakeview Low-Line is made possible through a partnership between the Lakeview Chamber of Commerce, Special Service Area 27, Friends of Lakeview, City of Chicago, and Chicago Transit Authority. PORT, a leading-edge design consultancy, has been hired to design the space. Special Service Area 27 is funding Phase 1 of the project; Friends of Lakeview will raise funds for Phases 2 and 3. Friends of Lakeview has partnered with Give Lively to securely process your online donation. This transaction will appear on your credit card statement as "Friends of Lakeview". This transaction is subject to Give Lively's Terms and Privacy.